Understanding the Hair Growth Cycle is an important part of learning how to improve how your hair grows. The growth cycle of hair is broken down into three key parts. Hair grows from the follicles underneath the scalp that are fed by blood that is rich with essential nutrients to promote growth. Understanding the science behind this will allow you to care for your hair during each phase of it’s development. Here is what you need to know about each phase. At any given time, up to 80%–90% of the hair on your head is in this phase. During anagen, hair fibers are made through the production of protein and keratin. The hair follicle begins to emerge from its pore, while oil is produced by sebaceous glands to protect and condition hair. Up to 1%–2% of your hair is in this phase right now. During catagen, the hair follicle shrinks, a part of it is destroyed, and the dermal papilla (which nourishes the follicle) breaks away to rest and rejuvenate. Catagen can last anywhere from 2–3 weeks. Up to 15% of your hair is in this phase. During telogen, these hairs do not continue to grow, as their nutrient supplier (dermal papilla) is in a resting period. Hair remains in the follicles for about three months, and is gradually shed during exogen, which is part of the telogen phase. 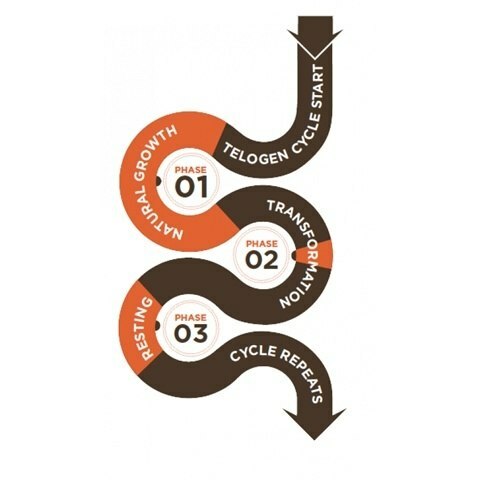 Telogen can last anywhere from 3–4 months. Without key nutrients, hair growth is inhibited during the hair growth cycle. Aviva’s exclusive active ingredients and complexes work with the natural phases of hair growth to provide optimal levels of these key nutrients at every phase. Providing essential ingredients critical to hair follicle health and function while promoting a healthy environment for hair growth. Aviva’s complexes provide the complete nutrition hair needs to grow long and strong for women and men.